Zoup! features hundreds of award-winning soup recipes with 12 rotating daily varieties, including low-fat, vegetarian, dairy-free, low-points and spicy options. 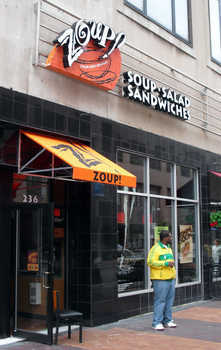 Zoup!’s Founder and Managing Partner, Eric Ersher created Zoup! after discovering that really good soup is hard to find. Also, in talking to people, it became clear that there’s something special about soup and the way it elicits thoughts of family, well-being and comfort for many people. Zoup! strives to offer authentic, hand-crafted soups that are as good – and as “feel-good” – as the homemade soups our mothers and grandmothers used to cook up. We have completed over a dozen Zoup! locations including Cleveland’s first location near E. 4th Street.